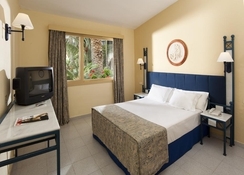 At the Hotel Parque San Antonio guests will be able to enjoy a relaxing getaway as it offers a comfortable and uplifting atmosphere as well as being ideally positioned in Puerto de le Cruz to access attractions, restaurants and conveniences such food and retail shopping, cash points and tourist information. The hotel is located 27km from Rodeos Airport with the closest beach to the hotel being just about 1km away. Guests can take a dip in Hotel Parque San Antonio’s outdoor swimming pool or unwind on the sun terrace. Be sure not to miss exploring the local area which affords many great places to visit no matter how you want to spend your holiday. If you’re looking for a relaxing time just taking it easy then a stroll around either Parque Taoro or Jardin Botanic may be in order or if you want to take in the rich local history then La Ranilla Art-Cultura art gallery and the 17th century preserved castle, El Castillo San Felipe may be just the spots to check out. Rooms are light and bright and come with a private balcony to enjoy the views. 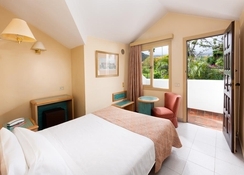 Hotel Parque San Antonio can be found just 27km from Rodeos Airport. The nearest beach can be found a little over 1km away. The local zoo, Loro Park, is only 2.5km from the hotel whilst the beautiful lush gardens of Parque Taoro and Jardin Botanic are both under 1km away. Visitors will find plenty of top restaurants and bars to this part of Tenerife within a 1km walk from Hotel Parque San Antonio. There are also many conveniences such as supermarkets, retail shopping outlets and shopping centres that are a quick and easy walk under 1km. Guests at Hotel Parque San Antonio will find 250 clean and comfortable guest rooms with a light, bright and airy atmosphere, perfect for your getaway. Whether you’re travelling alone, as a couple or with your family, there will be a room to suit you. Single Rooms are for one person and come with a single bed. 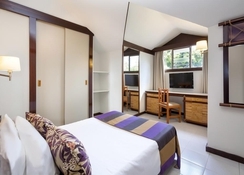 Twin Rooms feature two twin beds whilst a Superior Double Room is ideal for a more luxurious getaway as it features extra space with two large beds and a large living area for all the family to spread out in. All room types include an option with a private balcony, so you can enjoy the sunshine from your very own room. You will also find essentials in your room such as Wi-Fi, air-conditioning, telephone and safe deposit box. Guests can dine at Hotel Parque San Antonio’s main restaurant which caters to global and more local tastes and serves breakfast, lunch and dinner. The hotel’s lobby bar is a great spot to pick up a refreshing beverage while you relax, and you’ll also find a pool-side bar available. This part of Tenerife affords visitors a wide selection of cuisines from around the world. If you’re after a classic curry then head to Indian restaurant Jai Mata Di, delicious Italian can be enjoyed at Pastafiori and Saigon Delice will satisfy your Asian food cravings. In addition, there are plenty of places to enjoy traditional Mediterranean and Spanish dishes at places such as Tasco El Olivio and Restaurante El Camino. The hotel’s swimming pool is an ideal spot to cool off in or soak up the rays on the sun terrace. 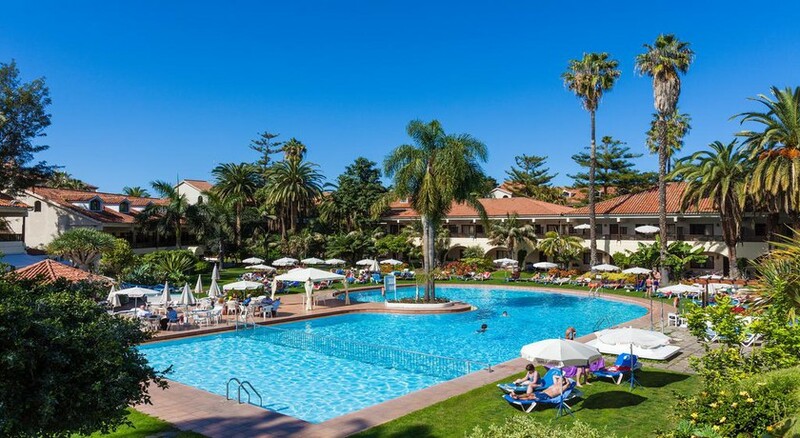 Alternatively, head to the beach and enjoy the Spanish sun on the golden sands or in the warm lapping waters of the Mediterranean Sea. Nature lovers can enjoy the lush tropical of either the Botanical Gardens or Parque Taoro, and there are plenty of cultural and historical highlights to be enjoyed too at places like the La Ranilla Art-Cultura art gallery and 17th century preserved castle, El Castillo San Felipe.